Welcome to Marvel Strike Force Heroes page. This is the full description of MSF Rocket Raccoon stats, skills and abilities. Rocket Raccoon is a powerful Guardian Blaster who works best when he is in a team with Groot. His first skill doesn’t inflict heavy damage but hits both primary and adjacent targets. His second skill delivers heavy damage to the primary target and has a chance to grant assistance from the ally. If Groot is his ally always grants assist and applies taunt on Groot. Rocket Raccoon ultimate deals 270% of his base damage to all enemies and grants him 2 counters but if Groot is his ally he inflicts 420% of his base damage instead. His passive ability is also very powerful and it grants 40% chance to applies 2 positive effects on 2 random allies each turn. Rocket Raccoon is very strong Blaster but he is really hard to obtain. His price is 100 shards which can be farmed only through Mega Orbs, Premium Orbs, Raid Orbs, and Raid Store. Keep in mind that sometimes his shards can also be bought in Supplies for Power Cores. Rocket Raccoon is an aggressive scrapper who inflicts terrible damage to foes at range. Prefers to team up with Groot. What are Rocket Raccoon's stats? 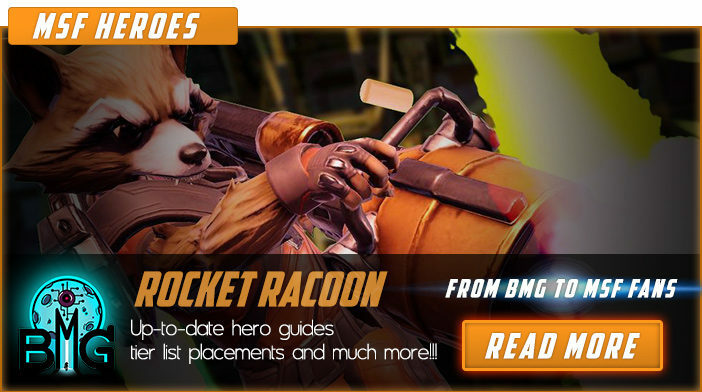 We hope that you enjoyed the description of MSF Hero Rocket Raccoon. For detailed information about other MSF Characters check our MSF Heroes page.